Adventures With Arnold – Girls, Gigs, And Breaking Mom's Recliner. Training with Arnold was one thing, but hanging with him was something else. Here's a trip down memory lane with the Austrian Oak. Training with Arnold was one thing, but hanging with him was something else. Aside from our workouts, we would have breakfast in the mornings at Zucky&apos;s Deli on Wilshire and 5th street in Santa Monica. Many of us were big fans of Zucky&apos;s and we always ran into someone from the gym or actors and other interesting people. It was a gathering place and a place to hang out either for breakfast or around 10 pm at night where a group of guys would get together again and eat cheese omelets. We had to have our evening protein and this was the place to get it. I always threw a lot of humor out and Arnold had a great sense of humor so maybe that&apos;s why we got along so well, but that&apos;s the way I am. I like to make things fun. He wasn&apos;t real good with his English, so he used a lot of my jokes and some of my catch phrases on other people as if he was coming up with them himself. It was really funny coming out of his mouth. To this day, I still hear him on some of the talk shows using phrases that I used back then. We had been at the beach one day and at that time we were asked to come in for a Chevy commercial by a representative of an ad agency because when they wanted Bodybuilders for any films, commercials, print, etc, the first place they came was Venice Beach and Gold&apos;s gym. I got a lot of movie and TV jobs just answering the pay phone on the wall in the gym as they were always looking for Bodybuilders for shows, called Musclemen back then. Arnold, Myself and a slew of bodybuilders shot the commercial for Chevy in one day and had to lift a huge car, which of course was cheated by cables. We got the taste of the business and decided to pursue more. "It&apos;s A Classic Photo Of All Of Us At That Time." Arnold was asked to read for some sort of Gladiator movie and asked me to come with him on the reading. So I went and we met the producer and writer. He read the script as we sat there and he stumbled on word after word, laughing all the way through it. It was really something. As we left and got in the car, he said to me, &apos;maybe there&apos;s a part in here for you too&apos;. I said, with the way you read that, you better forget being an actor! Should I shoot myself now? Who ever knew where it would lead? Shortly after that I landed a role on the FBI series and then a comedy role in the movie, &apos;BEN&apos; with the rats. Film work was on the rise for both of us. We had a lot of fun laying on the beach back in those days after our workouts or on week ends. We&apos;d all meet down there and spend the day. Then we&apos;d go over to the Marina to Jamica Bay Inn for lunch and take a swim in the pool. No one ever questioned us if we were staying at the Inn or not. Weekend nights we would hit the clubs in the Marina which was packed with singles from all over Los Angeles. Being bodybuilders, we stuck out in the crowd but attracted a lot of women. Getting a date was easy and getting the girls to pay was even easier when other guys were struggling to make conversation. But it was a game and we had fun with it. They always wanted to feel our pecs or biceps and the other guys around there just kind of looked on with envy. We were definitely oddities! Sometimes we&apos;d have commercial or film auditions together so either one of us would drive up to Hollywood and audition and grab an iced tea after. I was waiting at my car one time and here comes Arnold out of the building walking up La Brea Ave in shorts and short sleeve shirt weighing about 250 lbs. He looked huge and like a monster as cars were stopping and staring. It was really a fun thing to watch. Arnold had a certain way about him that people liked. He had a blind date set up and asked if I would come along cause his English wasn&apos;t too good. Rheo Blair who was the supplement king back then set up this date. He came up with the Cream and Protein diet that put on muscle and cut fat. His products were expensive but some of the best. Arnold introduced me to Rheo and set me up on a comp list in exchange for product shots. I got all the supplements I wanted free from then on and we had a great working relationship. So, I went on the date with Arnold and we ended up at Cafe Figuero in Hollywood. The girl was really pretty and I thought, well, if he doesn&apos;t like her, I&apos;d take her. It didn&apos;t work out - he wasn&apos;t really interested and I never got her number. I brought Arnold to dinner out at my Mom&apos;s house in the Valley. She lived with my Grandmother who was from the same town in Austria as Arnold. They hit it off and had a great conversation. Arnold plunked himself down on a recliner and broke all the springs out of it. My Mom made him a real Jewish dinner and still likes to talk about it to this day and how she had to throw out the recliner, as it was unfixable. Arnold had met a girl who was the hostess at Zucky&apos;s Deli and she was attending UCLA. They began to date and it lasted quite a while. He dated Barbara for many years and I thought that it might be a relationship that would last. He was attracted to her not only because of her looks but her intelligence, which was very important to him. They had a parting of the ways, but I often think about her as she was a friend of mine as well and wonder what she thought when saw him on the big screen and then as Governor. Then came the making of "Pumping Iron." They started filming in the gym and around town and one day I got a call from Arnold saying he was having a party so I should bring my guitar and come over. Oh, and by the way, we&apos;ll be filming some Pumping Iron as well. I said, &apos;Ok. The camaraderie in those days was a big thing. We all got along very well. In fact we were all called out to do a cover for Warner Brother&apos;s Records and I had better abs than Arnold in the photo and was in better shape at that time. It was a few hours work and the pay was great. It&apos;s a classic photo of all of us at that time. As timed moved on, Arnold got a few films and some celebrity events and his career started to go. He came into the gym when he was in town, but it got to be less and less. Wally Boyko ran huge Bodybuilding events at Disneyland and Arnold was his first guest one year. I had a booth selling Big Boy Clothing and as they marched Arnold around with his followers he spotted me and came to my booth to say hi. He told Wally that I was a terrific artist and was glad to see me there doing this. Then they pushed him on down the aisles. As he grew in the film business, he gained new friends and some of the old ones were set on the sidelines. He gave his roommate Franco a &apos;small&apos; role in The Terminator but that was it. As far as using any of us as actors, it never happened for whatever reason. 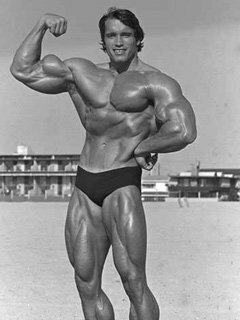 I get regards from Arnold through friends from time to time and saw him once at a stoplight in Venice. He didn&apos;t recognize me with the shaved head but when I told him it was me, he got very excited like a kid and said, let&apos;s get together and gossip, give me a call. I saw him not long after that at World Gym for a memorial as one of our friends passed away. Many of our old training partners have passed away and many have just dropped out of sight, however there are a few around that I try to stay in contact with and do interviews on. I&apos;m finding many that I thought were gone. It makes me feel good to still have that connection and the memories we shared of the Golden Era of Bodybuilding. This is just the tip of the iceberg as there are many stories to follow from back in the day.